Dorothy’s Jar Quilt evolved from her experience as a paediatric speech and language therapist. She talks about why she made the quilt and how it was later used by her husband as a teaching resource. Dorothy reads out some children’s poetry that was inspired by the quilt, and explains how children have responded to the quilt. Later she talks about her first experience of meeting quilters and some of the quilts she has made for family, friends and community projects, as well as her joys of buying fabric, doing redwork and spending time with her quilt group. 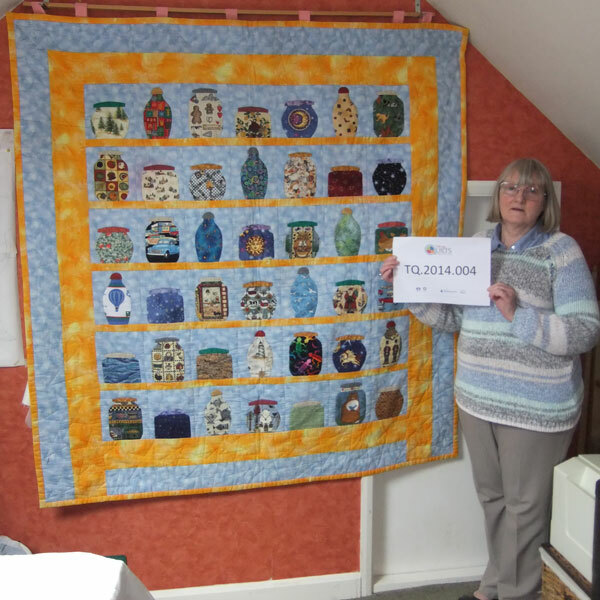 In the second half of the interview Dorothy talks about travelling and quilting (both in the UK and abroad), the role quiltmaking plays in her life and quilts she has made for charity or community history projects. Jackie Norris [JN]: Dorothy, can you tell me about this quilt that you have brought with you today? Dorothy Baird [DB]: Well it’s a very simple quilt, it’s a jar quilt made of scraps of fabric with anything from sea shells to spiders to lizards, to any little bits and bobs of children’s novelty fabric. And the thing about it, this quilt has its own personal story but it’s also responsible for dozens and dozens and dozens of other stories and rhymes and lots of other interesting things. So it’s a quilt with a story for a talking quilts project. I made it originally because several years ago, our local quilt show, we were due to have a celebrity open the event and rather than a payment we decided we would make a quilt for this persons children, and I made this for a little boy who was probably about 3 or 4 years old, and because I was a paediatric speech and language therapist at the time and my big deal was communication, language, bonding, attachment, all that kind of thing. I made a quilt for which there was lots of potential bedtime stories, bedtime rhymes, counting, colours, vocabulary and just general snuggling up to. So that was my brief. So the quilt was made and then within about ten days of the quilt show our celebrity had to leave and do something exciting overseas, so the quilt stayed with me and went in a cupboard and that was it for quite a long time until my husband resurrected it. Now, he’s a primary school teacher, semi-retired and he was doing supply work, so he took it into school one day and from that time onwards it has been used by children from four to ten, it’s been used for creative writing, poetry, short stories, it’s been used as a stimulus for drama sessions, it’s been used for PE. I said what on earth can you do with a quilt for PE and he said, well if you look at the jars on these shelves which is what the quilt represents, there are things which fly, that stretch, that crawl, that swim, that creep, that jump, and so I can honestly say that behind this quilt there are trillions of stories. Now, to me that use of language, expression, description from a 6 year old is pretty darn good. And then here’s another one and it’s called Juicy Water Melon Goody and it’s a jar with pictures of peppers and sunflowers and grapes, all sorts of fruit and veg and this little girls even written in the delivery, she’s put in the pauses for dramatic effect so here we go. Now she was 6 years old too, now how’s that for a quilt. So for Grandmas, Granddads, Mums, Dads, anybody who is quiltmaker, who wants to do something for a little one in their family to make something like that. A simple quilt with just jar shapes of novelty fabrics, needle turned or bondawebed; you’re stimulating, imagination and language , you’ve got things to talk and listen about, and you can cuddle up together at bedtime or when you’re feeling poorly; what a fantastic resource that’s so easy to do. We never dreamed this quilt would take off with a life of its own [laughs]. JN: It has a complete life of its own. You made it for a special person, does this person know of this quilt and what it has done? DB: No, no they have no idea but whenever I see this person, as I have done on television, I just think phewee I’m glad you really didn’t open our quilt show because far more people have had fun and benefit and adventures because of it than if we’d actually sent it to its rightful destination. JN: You don’t think you’ve deprived that child of something wonderfully special because of what it’s done for so many others. DB: I’m sure that child will have been well stimulated language and communication wise but, no I think a lot of children have had a great deal of fun through it. What’s interesting, my husband says when he uses it he shows the children of course, and then he throws it on the floor, and they take their shoes of, and in groups of about four or six they are allowed to sit on it, lie on it, stroke it, touch it, and he said curiously the people who seem to react to it most and get such a lot of pleasure from it and interest and excitement from it are the boys, which is unusual, I hadn’t expected that but I don’t know why they shouldn’t but it just seems that the tactile element, the visual combination of colour and shape and curious intriguing objects. It just seems to appeal. JN: You don’t thinks it’s because the boys see the quilt whereas the girls look at it and think about the making of it? DB: I’m not sure that they even consider how it’s made. It is just an object in its own right and it just has fascinating things to explore, because you can look along the lines of jars and my husband will often present it as you go into a sweet shop and there is nobody there, and here’s a set of shelves and on those shelves are all these mysterious jars, chose one jar to take down from the shelf, open the lid and oops – what happens next. JN: Your husband obviously appreciates your talents. DB: He was grateful for a resource let’s put it that way. JN: And it’s going to continue to be used for a long time to come. Have you put something in your will about this quilt? DB: No I haven’t because I think by the time I drop of this mortal coil this quilt will be so well thumbed and well used it will probably biodegraded by then. JN: People might wonder with the amount of use that this quilt has had, in all the activities it’s encompassed, have you ever washed it? DB: Yes, yes it goes in the washer from time to time, and it hangs on the line on a nice warm blowy day like all my quilts, I wash them all, I’m not precious about them at all, and they just dry naturally in the sunshine, quick iron, not too hot and it comes out bright as a button. JN: So, where did you start with quiltmaking, how long ago? DB: Let me see, I’ve always been a crafter, let’s put it that way. I used to, many years ago, to paint and draw landscape, mainly portraiture though I have to say, figure drawing and figure painting and that would go back to my childhood, but when I was a student in London I was very fortunate to study with a Royal Academy Artist and I did portraiture with him and from them on I’ve always dabbled whether it’s pencil, paint, pyrography, burning into wood, I love fiddling and twiddling like all crafters do and think if you turn your hand to one medium and you see something else that intrigues you, you turn your hand to that and have a go and one day probably in the 80s maybe, I was in Scarborough, saw a little notice in a shop, a fabric shop about patchwork, went in and I’d just missed a class actually, so I was directed toward my local patchwork and quilting group. I went along that night, didn’t have anything, I just turned up and there I met a friend who is still a very, very good friend now. I sat at a table with other people and within ten minutes I got needle, I got thread, bits of fabric and people were showing me and advising me on what to do and how to go about whatever was going on that night. From then, that’s it, completely hooked, lost to it. JN: You’ve not thought since then what you would have done with your time had you not taken that one step? Have you envisaged anything you might have missed out on instead of going quilting? DB: I would have probably have gone on with painting, I moved away from pyrography because it was like smoking 60 a day, you know, stains on the ceiling, my pyrographer’s cough. So I then switched to painting wood, the kind of detail I used in that I now use in my patchwork, so if I hadn’t found textiles I would probably have gone on in to something else, but having found fabric a lot of what I used to do in paint and pencil now appears in my patchwork because I’m not a great piecer. I have to say I do like picture quilts, I like images and I really, really love symbolism, I like things to be hidden and represented so there’s a story behind a story within a quilt. And I suppose somebody who has influenced me in that is somebody like Sheena Norquay, who‘s fabulous, particularly the earlier quilts with the rich Viking runes and symbolism that she has in her images, I just think it’s beautiful because you never know what layers you’ve still got to unpeel to reveal a story or a myth. So she was really, really key to me, influencing. DB: Oh yes, yes. And in terms of the craftsmanship of course Sheen Norquay is a wonderful craftsperson, her skills you can see in every piece she does, but Phillipa Naylor again in terms of free motion quilting the stitchery is breathtaking, you look at her work and you can go one of two ways, you can either think “oh I can’t do it, why am I bothering”, but then on the other hand you can think I can aspire to that, I can work toward that, I know what she has achieved and with practice, practice, practice, maybe one day I’ll be able to produce something like that but I doubt it very much. DB: I have, I’ve been to many workshops with her and another friend said to me oh do you want to sign up for the next Phillipa Naylor workshop and she said ‘quite frankly if she was laying stair carpet I’d go because she’s so wonderful at what she does and her work is so beautiful and stylish’, she is a very stylish individual herself and that comes across in her work. So yes I wish, I wish one day perhaps, but in my own little way I try to create images which have a bit of depth in them so you don’t always know on the surface what you’re looking at. You have to have a bit of an explanation or you have to look behind the picture that’s before your eyes. JN: With all this influence in quilting have you sat down on any given week with a project and worked out how many hours that project has taken you personally. DB: No, because I probably can’t count it in hours and I think of one piece I did for a friend of mine. She and I were working together in the health service and in our clinics we used to talk about a project she wanted me to do. She was a great gardener, and she wanted a piece to hang on her wall to represent elements of her garden but also to reflect the lives of her four daughters. Now I have to say from the conception to completion probably took something in the region of six and half years, mainly because we spent a lot of time in the first two or three years going round garden centres, doing research particularly into the coffee shops and the cake, that was very important. Once we both retired I found I could apply my mind to the actual piece and I was just about to embark on it and get cracking when she said ‘Stop I’ve had a thought, I’ve got one wall hanging which will be precious to me but I have four daughters, so when I die who gets it, who gets the quilt?’ So then we decided as the last minute adaptation to make it into individual 4 panels, each panel representing one of the daughters and her interests, and her pets and anything and everything that was important to her set in the context of Mary’s garden, Mary being my good friend. So along the way my husband would say ‘Haven’t you finished that damned quilt yet’, and I used to say ‘Oh come on, when Michelangelo was doing the Sistine Chapel there was no one there saying ‘Come on, Come on, get it finished’’ though I think the Pope of the time did give him a bit of a rough time, but it take as long as it takes. JN: Do you have any projects on your table at the moment. DB: Yes I do , I do, I have one which is a secret and I cannot divulge at the moment because of where it’s going but I need to get a bit of a shift on with that. I’m a deadline person but I take it right to the wire, you know what I mean. I live by the seat of my pants, because I just can’t plan early and work systematically through. I have an idea, I have the enthusiasm and the minute I know what I’m doing and I have the design underway I lose interest and I’m thinking of the next one. The actual, practical production of the quilt, creation of the quilt is a bit of a sideline, it’s the having of the idea and getting the design onto paper, that is the pleasure. Maybe that comes from my art background. Sewing the thing is something I have to do, but yes there’s that on the table. I have another project which I’m doing for next year, somebody asked me if I would do something for the First World War celebration, not celebrations. 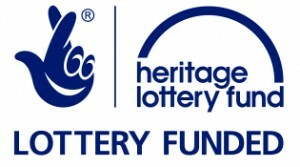 DB: Commemorations, that’s the appropriate word, and that I’m nudging on into next year but I am doing a piece based on a family from Robin Hoods Bay. Because they had a very remarkable story to tell, the more I think about it the more my quilts do tell stories, of a family of sons, one of whom stayed at home, he was too young to go to the First World War, the other sons, and I think there were six but I may be wrong there without my facts in front of me, but only the eldest one returned, the other boys were all lost. So I want to make this quilt something in memory to them and also I am going to be a Grandma in October for the first time so I have two baby quilts which I really have a deadline to meet on that. DB: My new baby yes. JN: This is one new baby. JN: What’s the significance of the two? DB: The fact that I went to Malvern about two weeks ago and saw far too much fabric so I got enough fabric for two quilts. JN: Did you impulse buy both of those? JN: You had no plan? DB: A vague plan, I knew I was going for quilt fabric, I am an impulse buyer, I confess, I’ve always been, I have a stash the size of a small industrial unit in my spare bedroom, most of which my husband doesn’t know about, but not to worry, but yes I impulse buy. JN: Do you have fabric in suitcases in your loft? DB: That is one thing I don’t have no, but I have it in every nook, cranny, drawer, on every shelf, under the spare bed, in boxes, bags, you name it, it’s there, and some of it I can’t bear to use now because it dates, you get fed up of the sight of it, some of it I adore so much I can’t bear to cut it up. I just take it out and look at it, stroke it against my cheek and put it away. Six years, when I think about it, seems to be a significant period because my cousin bought me some beautiful, very, what I would call traditional American folksy kind of fabric, she brought it back from America for me and I had that six years because I couldn’t bear to cut it up, I didn’t know what to do with it and somehow on the sixth year I knew and that’s my Christmas quilt that comes out every year. So I seem to have a long incubation period for use of fabrics. JN: Where would you see yourself taking your very obviously individual quilts to on the next level? DB: I like teaching, I do a lot of workshops for friends, let’s put it that way. I do workshops for my quilt group and I have a group of friends who meet in my home on a Friday morning who now are anything between beginners and intermediate quilters and we get a lot of fun, a lot of pleasure from that and I really enjoy sharing ideas and any skills I might have gleaned from other people along the way because I do think every individual gets something different from it, there are people who get solace from sewing, people who get excitement and a thrill from the creativity of it, there are people who use it to come through a difficult time, there are those who use it to pass things on to their grandchildren and their children and their friends as gifts, you know, we all do it in a different way for a different reason, but the group of friends I have on a Friday, my husband calls it ‘The Coven’ and that seems to suit us very well, nowadays when we meet on a Friday we don’t do a lot apart from drink tea and eat biscuits. But by the end of the day we’re so excited by the things we’ve seen that each person’s made, we bring things in if we’ve made something since the last visit, and everybody’s juices are flowing by the time they go so they go off and apply themselves either to an existing project that’s got a bit stale or to something new or they’ve seen what somebody else has done and would love to have a crack at themselves. So, I quite like just drifting along, with my pals, my quilting pals, whether in the work quilt group or through other things that I do and I like to see things moving on, and being passed on and sharing it. JN: Have you travelled extensively for your passion, because it seems to be a passion. DB: I haven’t done what a lot of people have done that is go off to America to Paducah and Houston all the other international quilt shows I tend not to do that. I travel a lot within this country, let’s put it that way. To the Festival of Quilts and to the different quilts shows at Birmingham and Malvern, and there’s been Loch Lomond and, yes I’ll travel around this country, I tend to travel more since I joined the Quilters Guild because as a former co-ordinator which I job-shared with a good friend, I travelled quite a bit for that within Yorkshire and Teesside. So yes have quilt will travel, but not shall we say internationally, no. JN: When you go to the shows and you see the quilts on display and you come across the highly commended or best in show or best in its class, what do you think makes a quilt stand out for you compared to what the judges might have seen? DB: Well shall I let you into a secret [laughs] and this is a really wicked secret now and I’ll be pilloried for it I know, but if I go to a quilt show I probably spend about half an hour looking at quilts and the rest of the time going around the traders because, I’m not a great looker-atter of quilts. I like to do it but I’m not a great observer of quilts. Now that is a terrible confession to make and in a, in a sort of permanent record like this. I do look at the quilts, yes I do, and when you say what stands out, craftsmanship, precision stands out to me and colour choice because I always feel, whether we always feel it I don’t know because I’ve heard lots of my quilting friends say this, ‘I’ve got a rotten eye for colour’, but actually I don’t think we have; I just feel we are very critical of our own work and we see the positive in other peoples work. So I like colour, I like craftsmanship, I like detail, and I do like quilts with images, though I wouldn’t say I would hang on those entirely because when I see a beautiful Baltimore or a fabulous symmetrical quilt, a geometric quilt with great skill & precision in it and remarkable visual quilts, like some of Ferret’s quilts you know, and they smack you between the eyes and you think ‘Oh is that a quilt or is it not!’ And again I think I like that because of my background with other media. Yes I confess I don’t spend a lot of time looking at quilts. JN: Is there anything in a quilt that you don’t like? Sometimes you see quilts or somebody is making a quilt at your group or you’ve gone to teach and somebody is making something with fabric in that class, is there anything that you have a particular ‘I Hate That’ feeling on? DB: I’m unhappy if people are careless because one thing I always feel is that if you take a bit of time and a bit of care in the preparation of your pieces, whether they are pieced quilts or whether they are the elements within a picture quilt, if you take the care at that stage, then the latter stages of putting it together are less painful and visually are better, more impressive, but if somebody doesn’t seem to care about a quilt that makes me sad because they’ve taken time and fabric and money, and some effort and they’ve thrown it away because they’ve not applied themselves to the basics. I think the basics are really important and you look at some really complex, apparently complex quilts and you break them down and they’re actually simple forms where the basic skills have been taken completely into account and the piece has gone together so beautifully that the overall impression is cracking and it saddens me that someone misses out on the satisfaction when something’s thrown together; and of course it ends up in a heap somewhere or in a drawer unfinished because you don’t love it. JN: Do you have many unfinished? DB: [Laughter] Yes I do, Yes; I’ve got things that have gone pear-shaped, quite a few things that have gone pear-shaped. JN: Have you thought of throwing them into a pot on a table and saying to people [DB laughs] ‘Rummage and see what you can make of that’? DB: No, I’ve thought of throwing them but not into a communal pot. JN: Not sort of cutting them up and turning them into something else. DB: No. No if they’re a disaster I can’t bear the sight of them and they’ll be, I won’t throw them away, I can’t bear to throw them away but they’ll be hidden away somewhere. JN: You have a sewing room stashed to the gills, in corners and around your house, with fabric, what would you be mad about if your house went up in flames, what would you dash into the house to save? DB: Now then, I’m having to think of that. I love the Christmas quilt I mentioned to you that my cousin gave me the fabric and it was the first pieced border with lots of little triangles that I’d ever done and I have to say it has a huge WOW factor because it has a lot of red and white in it, so it’s very dramatic and I do love that quilt. So I would save that. I’d save my cat because she is a very important part of my quilting, she’s my companion and she test drives every quilt by lying on it or under it at some point. My sewing machine I could live without because I love hand sewing, I like hand piecing and I love hand quilting, don’t do it very often these days, but I could live without my sewing machine; and I definitely could live without my rotary cutter so that could go up in flames. I could cope with scissors, one pair of large, on pair of tiny and that would do me fine and I would save any redwork I happen to have on the go because I do like redwork, I don’t always do it in red but I like the tiny stitches, the precision and the little pictures you can create from that. So those are the things I’d probably grab if I had to. JN: If somebody was to come to your house and look at your quilts for a piece to go into a specific collection or museum, what would you be most willing to give up? 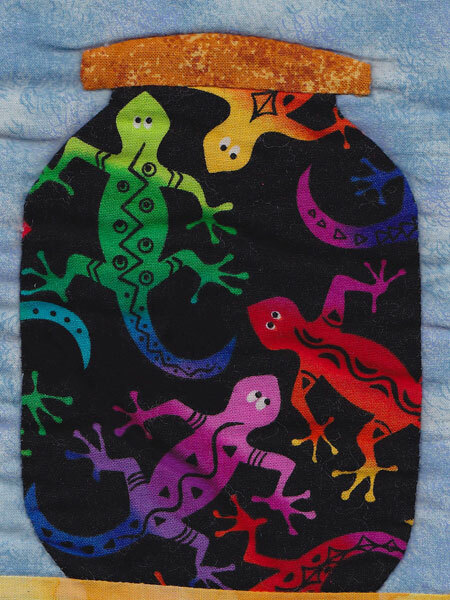 DB: I have a piece hanging on the wall that I made from fabric I bought in New Zealand. I bought a jelly roll in New Zealand and put it together and I hand quilted it with Maori symbols, again symbolism. So the quilt represents an awful lot, not only the journey and the pleasure of that and the memory of New Zealand every little piece of fabric has a picture on it. Having said that, I would think twice about buying a jelly roll of picture fabrics because on it there are not only flowers and flora and fauna of New Zealand, because it’s only 2.5 inch strips you’re liable if you’re not careful, to get the back-end of a cow or the front 2 legs of a sheep so they are not aesthetically beautiful but overall in a quilt it doesn’t matter, you get away with it. So that I would be quite happy to have hanging somewhere. Yeah, it reminds me of a trip, when you asked me before, am I well-travelled in quilting terms, no I’m not, but we did make a journey a few years ago around the world and, in the process stopping off at Hong Kong and Australia, New Zealand then back to America. By the time I got to New Zealand I’d bought so many bits of fabric and of course we didn’t have much excess luggage to put things in because we were away for a long time, I had to jettison my clothes, so I left various bits of my clothing around the world so that I could fit in fabric in its place. JN: Do you think next you would take pre-addressed jiffy bags and be posting stuff home. DB: I think I’d better, yes. I doubt I’ll be doing that trip again. JN: With all the new technology that’s available now compared to, even in the forties for patchworkers, what piece of equipment has made the difference for you? DB: I suppose in terms of speed, accuracy, the rotary cutter and quilters’ ruler and safety mat, very simple things, but they do allow you to speed up on the preparation stage and also it’s very neat. The new machines are fabulous, having said that the machine I use can do all sorts of fancy activities, but I really only use it for straight stitching, I use my walking foot, occasionally a zigzag and free motion quilting, so my darning foot and that’s it. So although it’s a super machine and I love using it I don’t use it to its full extent. JN: You obviously balance your time very well, has there ever been a time when you’ve been so engrossed that somebody has said ‘Are we eating today’? DB: Oh, every day I quilt. My husband says once I start quilting I don’t eat, I don’t need to eat, and normally I’m a very cold person, you know my feet and my hands are frozen, I’m always moaning about ‘put the fire on, put the fire on’. Put me in my sewing room, I don’t feel it, I don’t need the radiators on, don’t need anything, my world shuts down, my bodily functions shut down and all I do is sew. I could do it 24 hours a day. JN: Do you ever get up in the morning, and have breakfast and go straight to your sewing machine, how early might that be? DB: Ah well, I’m only human, no, I don’t do early, I can do late, I can stay up late, late, late, but I do have this conscience that says I shouldn’t be, I suppose it’s having worked all your life, I shouldn’t be sewing in the morning, I should be doing this or doing that, other domestic duties, but I am retired so I am allowed and yes I do sew in the morning, but I find I would rather nudge into the evening and the night than be around first thing in the morning. I do my other things first. JN: So you have priorities even with your quilting things. DB: Yeah I do, yes I still have that feeling that it’s a treat, that it’s an indulgence and that I should be doing proper things. DB: I shouldn’t be quilting in daylight hours when I should be doing other stuff. I’m getting over it! JN: Your attitude will change on that do you think. JN: Are you getting encouragement to change that attitude? DB: My husband’s brilliant, he’s very, very, very supportive, he’s very good and there are times when I’ve got a lot of things on, a lot of projects, yes I do, I do quilt during the day but I have, shall we say, other quilting related projects in hand like the Talking Quilts were doing now, like other regional things that I do, they have a quilting background so although I may not be sewing my mind is still very, very occupied with quilting business. JN: With all of the people that you’ve talked about, that you’ve seen and been to workshops with, if you could spend just one whole week doing nothing but quilting what person would you want to do that with? DB: That would be Sheena Norquay, definitely. JN: And would you go to Scotland to the Isle of Skye for that or have her at your house. DB: I would go, she could stay at my house any time, she could live at my house if she would like and I would probably go to the ends of the earth to have workshops with her. I think her work is beautiful, I think it’s superb, I love the spirit behind it, the spirituality of it and yes [cough] if I had to chose one, there are others, and I’ve mentioned one or two of them already, but for me if a name comes straight to the top of my pile immediately it would be Sheena. JN: Her particular style of work compared with your own, your own being very, very visual, would she influence you to change your own particular style? DB: I think we are all individuals aren’t we and we all interpret ideas differently and I don’t think her style is one that [cough] you could particularly imitate, let me put it that way, but her, the concept she has and the kind of ideas she portrays, that’s what I like. I couldn’t aspire to her level of technical skill. I have done workshops with her and really enjoyed them, but her technique is so well defined and well developed. I went many years ago to a workshop with Linda Straw and her beautiful, almost like medieval jewel like imagery, her figures which are like something from an illustrated manuscript, I thought they were exquisite. I did a workshop there, she layered silks up and sewed them from the back and then on the front cut through to the layer she wanted to display and, you know, with that I thought this is the most exquisite thing I’ve ever seen, but I could never in my life perfect a technique like this for me, and yet I could admire it so much in her. And in a sense with Sheena Norquay I love the ideas behind her work and I like to think she makes me think about representing things in an interesting and a visually entertaining way. That’s the kind of influence I think. JN: Do you have an extensive book collection that you use as a resource? DB: I do have a lot of books, I mix and match with friends, we borrow and we lend and we lose sometimes. Some of them are pattern books, I don’t often use patterns unless I’m doing something like, for instance, my baby quilt, but yes I do use lots of books, because I like looking at them, I like handling them, just like quilts as much as anything. JN: Are they part of your bedside reading? DB: Yes, yes, they’re not my bedside reading, they’re things I might refer to or buy because of an interesting style. I like the Tilda books, not that I make a lot of Tilda items, but I love the way they’re presented and I love the ideas and it’s such a beautiful style really, it’s lovely and I like things like that. JN: So when you’re coming up with a new project and you’ve got this idea in your head and you want to put it down onto paper, how do you start that, do you draught it all out before you actually cut fabric? DB: Yeah, it’s done exactly the way I would plan a painting, exactly the same and I’ve done, for example, we did the Wordsworth wedding anniversary quilt, 200th anniversary of the marriage of William Wordsworth and Mary Hutchinson because they were married at a village church, Brompton-by-Sawdon, just a few miles outside Scarborough and the village of Brompton-by-Sawdon had a huge weekend of celebration to mark this just a few years ago and they commissioned a quilt which several local members of the Quilters Guild worked on and one half, the central medallion of the church itself where the wedding took place, one side of the quilt was to represent Mary Hutchinson and the other side was to represent William. So it meant researching his life, his poetry, his relationships and hers, [laughs] there was very little of hers I have to say so it was a bit of a struggle to balance it but looking at photographs, images, old print of places, reading his poetry, picking out elements from that. They were the source if you like, for the designs for the individual blocks which went out to the quilters. Another occasion we did the Helmsley Walled Garden quilt for them to raise funds for the walled garden there and that was a case of going to Helmsley, talking about the garden, hearing about its history, its structure, what the special flowers were and then creating a paper image from lots of sketches and photographs to represent the main elements of the garden. And then the Heartbeat quilt, which again was a charity quilt and that was done at the time that the television programme was current in Goathland because of course that’s fairly local to us, and we had a friend who knew somebody working on the set so the cast and crew agreed to sign plain blocks, 6.5 inch blocks of calico, so I sent all the blocks and I sent the relevant fabric pens, yeah. Of they went and when they came back these blocks had been signed with red felt tip, black biro, you name it, any old thing that they could sign it with so of course you couldn’t put that into a quilt, but anyway we got round that by scanning them onto a computer and printing them onto the fabric that goes through the, but creating that it was all put together in the same way that you would create elements of a picture or a painting. Photographs, research, talking to people, sketches and then the final sketch and then you work on the quilt from that. JN: So are all your quilts totally unique, you’ve never sold a pattern for anything or given a pattern away. 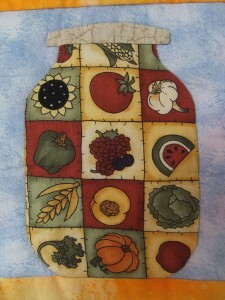 DB: I’ve given loads of patterns, particularly redwork patterns I use with my own quilt group and my local quilt group. I’ve devised appliqué, pictures of sailing boats and cobbles and what have you when you’ve done workshops of those. JN: Does it bother you that people might be using those ad-hoc wherever. DB: I don’t care, it doesn’t matter, you know I’m not a professional quilter, why be precious, we have a bit of fun, we have a good time, we make something that somebody may feel happy with and looks nice. I know people have gone on to use my bits and bobs elsewhere and, you know what’s the… if I made an income from it that’s different. JN: You’re spreading the word. JN: In all of this. DB: Yeah, I think so. 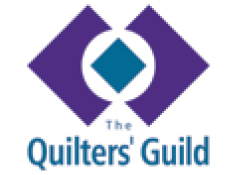 JN: Are you contented as a quilter making quilts and spreading the word? DB: Oh Yeah, I mean yes, absolutely. I’ve had so much pleasure, I’ve had an enormous amount of pleasure from it and I just like, I like doing it, I’ve always twiddled and fiddled and doodled, always. I’ve always created pictures one way or another. If I was precious about it then I would do what all professional artists do, but I’m not a professional artist, I don’t purport to be and I never will be, I just like doing stuff with my friends and making things. And I’ve had ideas from other people, other people share their ideas with me, it’s just that two-way process and it suits me and it works fine for me. JN: I have to say it’s very interesting hearing the background to all of your patchwork and quilting over the years Dorothy. Thank you very much.